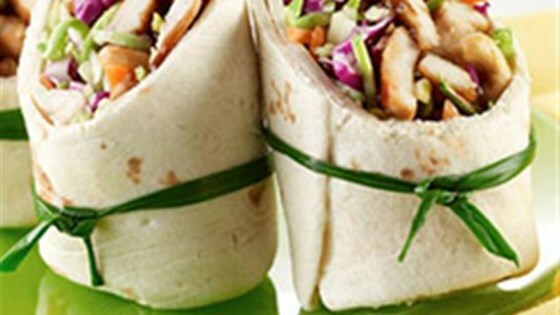 "Fast and yummy Chicken Wraps using Teriyaki Sauté Express ® Sauté Starter." Combine cabbage and carrots in bowl; set aside. Melt Saute Express(R) squares in 12-inch nonstick skillet over medium-low heat just until bubbles begin to form. Add chicken. Cook, stirring occasionally, 5 to 7 minutes or until chicken is no longer pink in center. Add cashews and green onions; stir. Continue cooking 1 to 2 minutes or until heated through. Place 1/4 chicken mixture onto each tortilla; top with 1/4 cabbage mixture. Fold 2 opposite sides of tortilla over filling. Starting at open end, roll up tightly to enclose filling. *Substitute 1 1/2 cups packaged Asian slaw for cabbage and carrots. Yummy! I melted an extra sauté express block for some extra sauce! loved it but since you can't find the butter squares anymore here's how you make it. you use your favorite teriyaki sauce with sesame seed oil and a little butter melted all together. Excellent as written, and also a great way to use leftover chicken! I don't think the packets are made anymore (at least, not available in my area), but teriyaki sauce will do the trick! Loved the sauce and how juicy the chicken was.